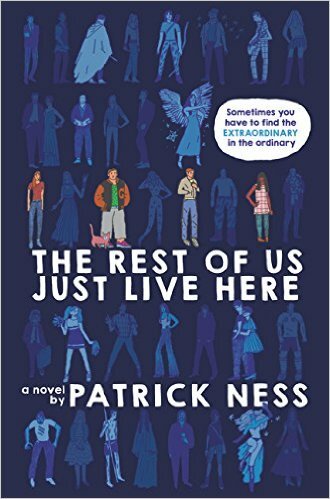 I’m pretty convinced Patrick Ness is a genius. I love his Chaos Walking trilogy, and A Monster Calls moved my whole heart. He pushes the limits in such brilliant ways, and The Rest of Us Just Live Here is no exception. I loved the concept: very, very few of us can be “the Chosen One.” While Harry Potter was off saving the wizarding world, most young wizards were just trying to get good grades in double Potions. I think of Tris, of Katniss, and even of Bella … all in the center of the action. But what about the teens who were on the outskirts of it all, knowing things were going on but, for the most part, not affected by them in their daily lives? That’s what TROUJLH is about. It’s narrated by Mikey, who has been getting into these “loops” (washing his face over and over, or his hands, or counting the corners of his textbooks, etc. ), and about his sister Mel, and their friends Jared and Henna. Each chapter starts with a brief explanation of what’s going on with the “indie kids” (i.e. the Chosen Ones, the heroes), and then spends the rest of the chapter on Mikey and his friends. We see the things happening to the indie kids– but it’s very peripheral. Mikey and his friends just want to make it to graduation. I liked it. It was such an interesting concept and very well done. It poked fun at YA tropes in ways that made me smile. I recommend you read it. It was interesting to read about Mikey’s OCD. Sometimes I thought, “Yes, yes, yes, this is what it’s like,” especially when Mikey talked about hating himself and about this perpetual wrong feeling. So many of us OCD sufferers can relate to that. But it was a little hard for me to identify Mikey’s obsessions. There was, I suppose, a vague worry about something bad happening to him and his friends, but it wasn’t sharply tied in the text to his compulsions. For me, my obsessions always took the front seat and my compulsions were closely and obviously (even if foolishly) connected to those obsessions. But my compulsions were never really like Mikey’s (counting and washing and repeatedly doing something till it “feels right”), so I guess I shouldn’t compare too closely. I guess I worry that someone who knows nothing about OCD would read an account like this and fail to really understand why the compulsions are there, what they are doing, the faulty logic of it all. There wasn’t a huge theme of uncertainty (though there was a small one), and for those of us with OCD, uncertainty is the biggest hurdle of our lives. I am glad that OCD was never portrayed as Mikey being a neat-freak, which would have sold the disorder short. Ness did show how depressed Mikey was due to the compulsive loops. This was a great read. Can’t wait for Ness’s next work.